The inner ear is a complex sensory organ located in a cavity of the temporal bone. It is filled with two lymphatic fluids which are separated by a thin membrane (Figure 1). The inner ear can be split into a low-frequency system (balance sense) and a highfrequency system (hearing sense). The low-frequency system responds to angular movements of the head which induce a flow in the semicircular canals (SCC) due to the fluid inertia. This flow stimulates sensory hair cells in the cupulae which leads to the perception of angular motion. The high-frequency system is driven by acoustic stimulation which leadsto a pulsating flow field within the cochlea. This flow interacts with a membrane with graded stiffness. Local resonance phenomena of this fluidstructure interaction allow the detection of the frequency of the acoustic signal. 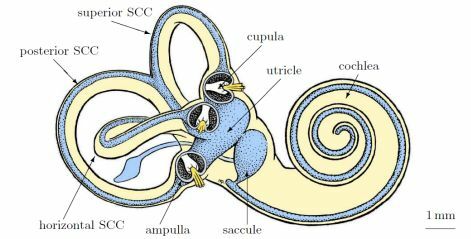 Experimental data by Békésy1 and theoretical considerations by Lighthill2 suggest that there exists a streaming flow (non-zero mean flow) within the cochlea despite the small Reynolds numbers in the inner ear. We will present numerical results for the flow field within the cochlea and the flow field within the SCC. Both flows show a significant streaming component which is closely related to the fluid-structure interaction between the pulsating flow and the elastic membranes. We will study these two flows with respect to their Eulerian and Lagrangian means. Furthermore, we will discuss how the observed streaming phenomena may be related to the physiology of the hearing and balance senses.